Posted by Doriano "Paisano" Carta in Books, social networks. Yes, even book lovers have their own social networks these days. The two best sites appear to be Shelfari and Library Thing. All others don’t stack up (ha ha..er..um sorry). 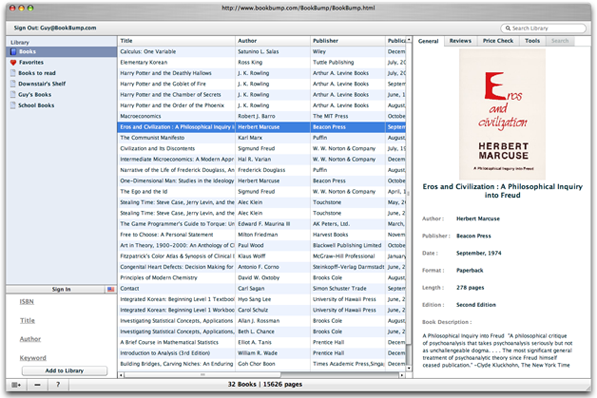 BookBump is described as the iTunes for books. The interface is the best around but it doesn’t have all of the web 2.0 sharing features that Shelfari and others are offering. Still, if all you want to do is manage your book collection and you don’t care about sharing book collections with others, then BookBump could be the right service for you. Shelfari has a nice look and feel and offers many features all for free. Your book collection is displayed cleverly on a virtual bookshelf (hence the name). Another unique feature is the Groups (Book Clubs) you can create or join to discuss and share reviews about different types of books. LibraryThing has a huge amount of book titles to choose from, but their free account limits you to only 200 books. It’s $10 a year for unlimited books which is dirt cheap. The website itself is nowhere near as impressive as Shelfari and doesn’t offer as many features or types of collections you can keep or share. Catalog with Amazon, the Library of Congress or 175 other world libraries. Import from anywhere. Get recommendations. Tag your books and explore others’ tags. Put your books on your blog. Enter 200 books for free, as many as you like for $10 (year) or $25 (life). BookMooch is not really a social network for book lovers as the previous two sites are. What it really offers is a bartering/trading system where readers can exchange books to earn points which they can use to get more books to read. The service is free with the only costs involved are the shipping fees to mail books to other members, who will return the favor (in theory). Interesting concept, sort of a NetFlix for books. SwapTree is similar to BookMooch in that you can swap books but it also allows you to exchange other items such as Music, DVDs, and games! Shelfari appears to be the clear leader when it comes to social networks for book worms. It’s an excellent way to track which books you’ve read or want to read. 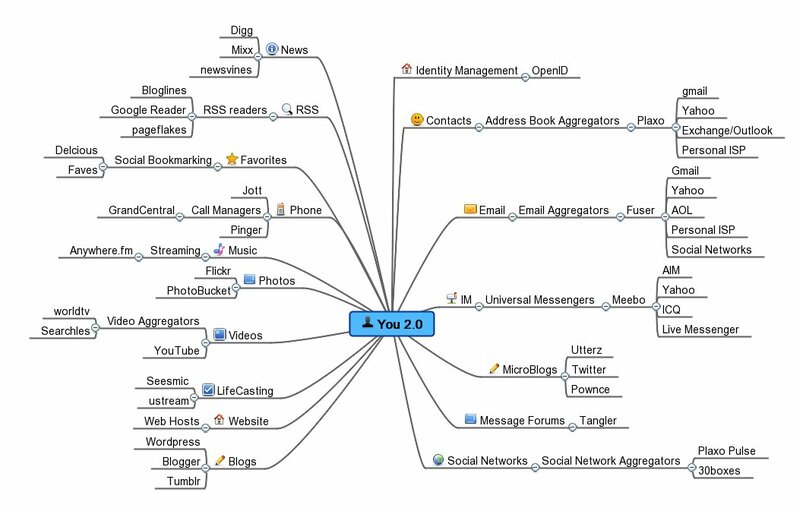 Posted by Doriano "Paisano" Carta in Enterprise, social networks, Web 2.0. Believer it or not, you can actually build a social network for your enterprise for free. Thanks to Microsoft’s free Windows SharePoint Services (WSS) and free SQL Server 2005 Express database, you can design and deploy an entirely new collaborative intranet or social network for your company that features many of the hottest web 2.0 features such as wiki’s, blogs, RSS feeds, calendar sharing, document sharing and more. Not only is it all free, but it can all be setup and ready in just a couple of hours. I know because I’ve done it. There is confusion when it comes to Microsoft SharePoint. Most people automatically think of Microsoft Office SharePoint Server (MOSS) 2007 Server which is extremely expensive and not Windows SharePoint Services (WSS) which is free! Obviously, you get what you pay for when it comes to features and performance, but WSS is perfect for many companies, especially small to medium-sized organizations that cannot afford the expense that a fullscale SharePoint deployment costs. One of the reasons that makes SharePoint so expensive is its reliance on Microsoft SQL server, which isn’t cheap. The good news about the free WSS is that it uses the free Microsoft SQL Express 2005 database, which is robust enough for most environments.Here are the most important differences between WSS and MOSS. Search across site collections – In WSS, each site collection is an island unto itself. MOSS adds the portal umbrella that pulls together those separate site collections and allows for searching across them. Personalization – MOSS allows users to have individual, personalized sites; WSS doesn’t. Audience Targeting – MOSS allows you to target content to specific user groups; WSS doesn’t. Crawl and Index sources outside of SharePoint for searching- MOSS allows you to return search results for indexed sources such as file shares, web sites, Lotus Notes databases, and much more; WSS can only crawl and index WSS sites. Search administration and customization – MOSS gives its admins much more control over the configuration of its search engine; WSS doesn’t. Business Intelligence – allows you to track key performance indicators and build BI dashboards into your team site. The dashboards can assemble and display business info using Excel spreadsheets, SQL, or integrate with line of business applications. Excel Services in MOSS go beyond simply displaying Excel spreadsheets, you can actually stream parts of a spreadsheet, showing or hiding various parts. Note: The crawling, indexing and searching “weaknesses” of WSS can now be resolved by using Microsoft’s Search Server 2008 Express which is also free! Here is an exhaustive feature comparsion matrix for all SharePoint versions. Also, keep in mind that you can always upgrade from WSS to MOSS if/when the time (and BRINKS truck) comes! It is amazing just how many features there are in the free SharePoint version (WSS 3.0 SP1). Most companies make SharePoint their intranet, thus becoming ground central for communication for all employees. Here are the most popular and useful features that you can use with your new SharePoint intranet. Here are the most popular components used in SharePoint on the leftside of the browser and called the Quick Launch. Keep in mind that these components can all be used within each department’s portal! For example, you will find all of these elements on the intranet’s home page for all employees as well as in each department’s private area. Thus, H.R. can post public news and events on the main site for all employees to see and private information within their locked down area. Announcements: Usually placed on the home page at the very top. Company news and announcements go front and center here. Calendar: All company events and activities go into this public calendar. Holidays are usually added as well. Contacts: All contact information is centralized in this public address book. It can include information on employees, vendors, partners, clients, etc. Tasks: Action items and people assigned to them. Wiki: Yes, you can launch wiki’s at will in the enterprise! They can be public wiki’s or private wiki’s for projects. Blog: Yes, blogs are part of this free SharePoint as well. Companies use them for news updates or for project status updates. Message Board: If you need a good old fashioned message forum then here it is. Image Library: Control all authorized images, logo’s, etc. Forms Library: Maintain all official forms and templates in the forms library. Shared Documents: Ah, my favorite feature of them all. Companies can now have their own ECM (Enterprise Content Management) system for free! Create centralized depositories for all company documents and files and let SharePoint control versions and updates. Makes searching and finding documents much easier. Surveys: Excellent way to take company polls on any subject matter. Meeting Workspace: Powerful feature that assists with meetings. Documents decisions made, task assignments, agenda notes, and more. RSS Feeds: Just about everything can have its own RSS feeds and email alerts! Note: These are just some of the many features and components that are available for Windows SharePoint Services! See the links section below for more template examples available for free from the web! WSS allows users to access just about any information thru their Microsoft Outlook 2007 client with seamless integration and synchronization. Users can link SharePoint calendars, tasks, contacts and document libraries. Watch the videos below to see just how easy it is to do. Here are some useful links that will provide information and tools that will make your new SharePoint intranet more stable and powerful. Here’s how to setup a SharePoint Wiki. Here is a video that demonstrates how easy it is to link a SharePoint calendar with the Outlook calendar. Here is how to link Outlook 2007 with SharePoint Document Libraries. Windows SharePoint Services (WSS) is powerful set of tools for the enterprise at any cost. The fact that WSS is free and easy to install makes it a no-brainer when it comes to deploying a versatile intranet or social network in the enterprise. If nothing else, WSS can help lead the way to Microsoft Office SharePoint Server 2007 solution which has even more enterprise class features with greater levels of load balancing, availability and complexity. In the mean time, deploy your own Enterprise 2.0 today! Posted by Doriano "Paisano" Carta in Semantic Web, social networks. Vizster was a project from 2004 developed by Jeffrey Heer and Danah Boyd that focussed on Visualizing social networks. I don’t know whatever became of this interesting approach to viewing social networks, but I hope someone continues their impressive groundwork. I have no doubt that we will all see this technology implemented in the Semantic Web (aka web 3D, my term). Yes, the Semantic Web will be mostly about A.I. (Artificial Intelligence) and smarter search engines based on more intuitive databases, but I also contend that interactive visualization will be a major component of the future of the web. I believe we’ve already started to see various forms of its implementation. Here is an example of one site that I enjoy called MusicMesh that resembles Vizster with visual nodes and links. In this case it connects music artists to their albums and songs along with a mashup of YouTube for the connected musicvideos. Brilliant use of a visual tool and mashups to deliver a unique experience and useful and entertaining result. Notice how each click delivers numerous “intelligent” changes including: wikipedia entry for the selection, reviews, amazon listings for purchase as well as the music video on YouTube. It also displays other artists it “Thinks” you would be interested in based on your selection. This, my friend, is the heart of the Semantic Web. Posted by Doriano "Paisano" Carta in Blogs, Social Aggregators, social networks. Circavie is a service that lets you create visual timelines of anything you want to document online. Each entry can include hyperlinks, images, text and even comments. You can navigate the timelines via the arrows at the bottom of the screen or by clicking anywhere on the timeline and scrolling left to go back in time or forward for the future. Dandelife does much more than Circavie because it can also serve as a social network aggregator and include your streams from other services like Twitter, Flickr, delicious and more.